I personally do not regard the Cyprus issue as essentially a problem of invasion and occupation, U.S. Ambassador to Cyprus John M. Koenig has said, noting that it`s up to the Cypriots to reclaim the Cyprus Dream. Koenig was speaking at an open discussion held Tuesday by the University of Cyprus and US Embassy in Cyprus on “Cyprus at a Crossroads: A diplomat reflects on three decades of engagement with the Eastern Mediterranean.” on the occasion of his retirement from the US Department of State. In reply to a question from the audience regarding the presence of 40,000 Turkish soldiers and tens of thousands of settlers on the island, Koenig said that: “I personally do not regard the Cyprus issue as essentially a problem of invasion and occupation. If you don`t like it, I can`t help it. I do not regard that as the core of the Cyprus problem”. “That is a huge problem however and the mechanism exist in order to reconcile the issues and it is the Cyprus settlement negotiations which take place under the aegis of the United Nations. This will address all of the issues related to the Cyprus conflict”, he added. The American Ambassador went on to say that “the Cyprus conflict of course began 51 years ago and in that context of course it took a huge and tragic turn in 1974 and I am not in any way justifying what happened then, but it cannot be reduced to a problem of invasion and occupation. That is in fact to ignore your own history”. So, he continued, “ you have many things to deal with apart from Turkey`s presence on this island, the presence of Turkish troops which we do not support or accept, the presence of settlers which we do not condone. These all are issues that however need to be addressed in the context of settlement negotiations and we have to take into consideration the views of the Turkish Cypriot community as well”. “This is what Cyprus solution is all about. This is also what reconciliation is about”, he said. Koenig also said that “I don’t think I have met a Turkish Cypriot -maybe there are a few out there – who actually believes that the Cyprus problem is a problem of invasion and occupation and these are the people you need to make peace with. So you better pay attention to how they see the Cyprus problem as well”. In his address, Amercian Ambassador said, inter alia, that “ this is an extraordinary time in Cyprus. Just eleven days ago, Nicos Anastasiades and Mustafa Akinci launched a new round of settlement negotiations under the most hopeful circumstances. Look around Cyprus. Beyond the island`s shores, there is turbulence, discord, danger. On the island, the past few years also have not been easy ones, on either side. Yet the election on April 26 of Mustafa Akinci and the manifest good will both leaders haver shown as they embark on a new round of talks, have galvanized the people of this island and grabbed the attention of policy makers in Washington and other capitals”. He said that it brings to his mind Barack Obama`s second book published in 2006 “The Audacity of Hope: Reclaiming the American dream”. “Please don`t miss this chance to bring the communities of this island back together and realize your aspirations for a better future. 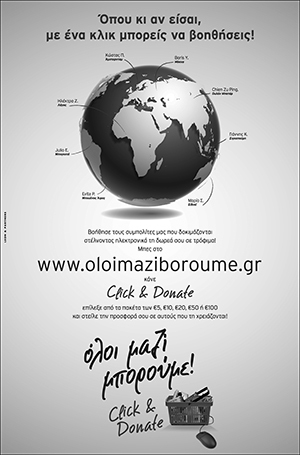 Every Cypriot has a role to play in this effort. As the American Ambassador, I can assure you the United States will do all we can to support the settlement process”, he said. He concluded by saying that “as an American who has spent most of his life living with your successes and setbacks, your hopes and concerns, I promise I will never stop doing what I can to help you realize your vision of a reunited island. But it`s up to you the Cypriots to reclaim the Cyprus dream”. Cyprus has been divided since 1974, when Turkish troops invaded and occupied 37% of its territory. UN – led talks aiming at reunifying the island under a federal roof resumed this month.